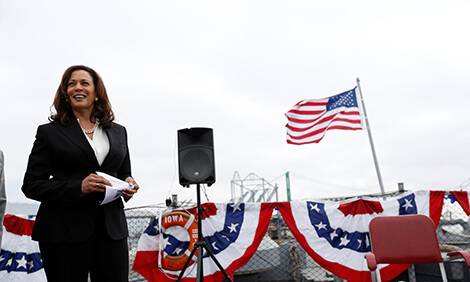 Senator Kamala Harris attended a ceremony where children were sworn in as U.S. citizens on the deck of the USS Iowa Museum in Los Angeles, California. Senator Harris has also been very vocal about U.S. immigration policy. She is a strong supporter of keeping the Deferred Action for Childhood Arrivals (DACA) program active. This legislation makes it possible for young people, who were brought to America as children by undocumented immigrants, to stay in the United States, which they consider home. These young men and women are often called DREAMers. Harris has vowed to oppose any government spending bill, unless Congress agrees to protect the nearly 700,000 DREAMers living in the United States. Harris herself is a child of immigrants. She is proud of her diverse background. She is the first Indian American U.S. senator and the second African American woman to be elected to the U.S. Senate. Her mother was born in India, and her father was born in Jamaica. Growing up in Berkeley, California, Harris mostly lived in African American communities and attended African American churches with her family. Her mother also took her to Hindu temples to worship and on trips to India every other year to visit relatives. Harris started working for human rights at a young age. Her parents took her to civil rights protests. After her parents divorced, she moved to Montreal, Canada, with her mother and continued to be an active citizen. When she was only 13 years old, she organized a protest to allow children to play in a grassy courtyard in the apartment complex where she lived. She successfully convinced the complex to change the rules. Later, as a young adult, she worked as a volunteer on political campaigns, such as Jesse Jackson’s presidential campaign. After finishing high school in Montreal, Harris attended the historic African American college, Howard University, in Washington, D.C. She then moved back to California to attend the University of California, Hastings College of Law. After graduating from law school, Harris became a deputy district attorney in San Francisco. She next became district attorney of San Francisco and then served as California’s state attorney general before running for Senate. Spending time with her family, especially her niece Meena, continues to be one of Harris’s favorite activities. She also likes listening to music and reading. She enjoys reading The New York Times on Sundays and cooking dinner with her family when she has time. Her job as U.S. senator keeps her very busy. She spends many hours working on issues important to her and her constituents, such as providing affordable healthcare, improving the criminal justice system, and protecting the environment.